1. Elevating energy levels, vitality and stamina. 3. Enhancing immunity – Amrit Kalash is a full spectrum antioxidant and one of the most powerful scavengers of free radicals which are responsible for most degenerative diseases. 4. Promoting “BALA” or vital strength that enables the body to fight back diseases. 5. Improving and maintaining overall well-being. If you have a sugar intolerance, try this alternative to the traditional Nectar formula (MA4 Herbal fruit concentrate Jam). It contains the same ingredients listed for Nectar minus nearly all of the sugar. Contains no clarified butter or honey. Formulated especially to improve natural immunity and clear the energy pathways of the physiology. 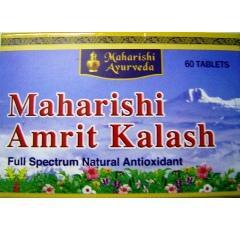 Amrit Kalash is simply the most powerful antioxidant available on the market today. And with its natural, traditional ayurvedic formula, it’s also the safest. Choose the best antioxidant. Choose Amrit Kalash! Each 1000mg tablet contains: Amla (fruit rind)*, Chebulic myrobalan (fruit rind)*, Sandalwood (heartwood), Mesua (flower)*, Cinnamon (bark)*, Cardamom (fruit)*, Gotu kola (whole plant)*, Dwarf morning glory (whole plant)*, Turmeric (rhizome)*, Long pepper (fruit)*, Licorice (root)*, Vidanga (fruit)*, Cyperus scariosus (root)*, Cyperus rotundus (tuberous root)*, Fragrant padri tree (bark) extract*, Yellow-fruit nightshade (whole plant) extract*, Three-lobe-leaf cowpea (whole plant) extract*, Uraria picta (whole plant) extract*, Sarivan (whole plant) extract*, Boerhavia (root) extract*, Oroxylum (bark) extract*, Indian kudzu (tuberous root) extract*, Shatavari (root) extract*, Heart-leaf sida (whole plant) extract*, Clerodendrum phlomidis (whole plant) extract*, Malay bush beech (bark) extract*, Blue wiss (whole plant) extract*, Bael tree (bark) extract*, Wild sugarcane (root) extract, Solanum anguivi (whole plant) extract*, Pedalium (fruit) extract, Leptadenia (whole plant) extract*, Gymnema aurantiacum (root) extract, Finger-leaf morning glory (tuberous root) extract*, Tribulus (fruit) extract*, Sugarcane (root) extract, Eragrostis cynosuroides (root) extract. Other ingredients, from natural sources: Talcum, Starch.